In this installment, we take care of some housekeeping before moving on. We've limited true Antarctosaurus to A. wichmannianus, leaving us with a few extra species which haven't amounted to all that much. (A. septentrionalis is excluded from that comment, now having its own genus Jainosaurus.) "A." brasiliensis and "A." jaxarticus might not be the most exiting species, but we've also got the hidden giant "A." giganteus. "Antarctosaurus" brasiliensis does not seem to have made much of an impression on the science of paleontology, and has served primarily as a "space-filling taxon", filling a paragraph or two in summaries of broader topics (Brazilian dinosaurs, South American titanosaurs, the Bauru Group, etc. ; you get the idea). When someone writes something in this vein, they usually make sure to mention that "A." brasiliensis is a dubious species relevant in some way to the discussion at hand. It's not the most graceful way to go through eternity, but it beats being almost entirely forgotten ("A." jaxarticus). Although some sauropods have gotten by with less, two partial limb bones and a partial dorsal vert haven't cut it for "A." brasiliensis. The only publication I can think of from the past thirty years where it has been considered valid is McIntosh (1990), and that's only partial credit because he didn't actually write anything about it and it's really only valid by context (it's in a list of valid sauropods). Kellner and de Azevedo (1999) reassessed the material in their description of Gondwanatitan faustoi. They regarded the type material as titanosaurian (titanosaurid of their usage), but poorly preserved, indeterminate at the species level, and not necessarily all from one individual. The only feature of note was the relatively small deltopectoral crest on the humerus (a ridge for muscle attachment), which served to distinguish it from their Gondwanatitan faustoi. A variety of other publications have concurred with the assessment that "A." brasiliensis is dubious (for example: Powell 2003; Candeiro et al. 2004, 2006; Upchurch et al. 2004; Kellner et al. 2005; Candeiro 2006). Apparently (which I say because I haven't seen the original report, only the secondhand account in Candeiro et al. 2004), Bonaparte (1978) assigned fossils from Minas Gerais State to this species, which eventually filtered into The Dinosauria without further comment (McIntosh 1990; Weishampel 1990; Weishampel et al. 2004). "Antarctosaurus" giganteus was a big sauropod. When I say "big", I don't mean a regular ol' big sauropod. I mean "femoral length 235 cm (7.7 ft)." That kind of size puts "A." giganteus into the upper echelon of sauropods. Why hasn't this species been more widely publicized? The most obvious answer is that its very limited remains have held it back. Once you've observed the obvious—"Gee, that's big"—there isn't a lot of conversation left. "A." giganteus has so far made a better answer to a trivia question than a taxon, and as such is kind of stuck as the hipster's giant sauropod, known only to an in-crowd. The femora of "Antarctosaurus" giganteus, at the Museo de La Plata (Figure 8 from Otero and Reguero 2013). "A." giganteus was described by von Huene in 1929, in the same monograph he described A. wichmannianus. He designated it cf. Antarctosaurus giganteus, indicating he wasn't quite sure it should be in Antarctosaurus. Almost the first thing von Huene did was to mention its size; he regarded the holotype as the largest sauropod yet known. Just to show that media inflation of sauropods is not new, he also mentioned that preliminary reports gave a femur length of 2.70 meters (8.86 ft), about a half meter longer than the reality. The remains, which came from a place called Aguada del Caño in Neuquén Province, Argentina, included two femora, parts of both pubic bones, the distal end of a poorly preserved tibia, fragments of six long bones, fragments of ribs, and two caudal vertebrae. One note of caution: he also reported remains of a smaller titanosaur from the same site, and you've got to be ready for strangeness when von Huene is dealing with a titanosaur bonebed. I bring this up because he noted that the caudals were relatively small (13 cm/5 inches long each, minus articulation), indicating a short tail. 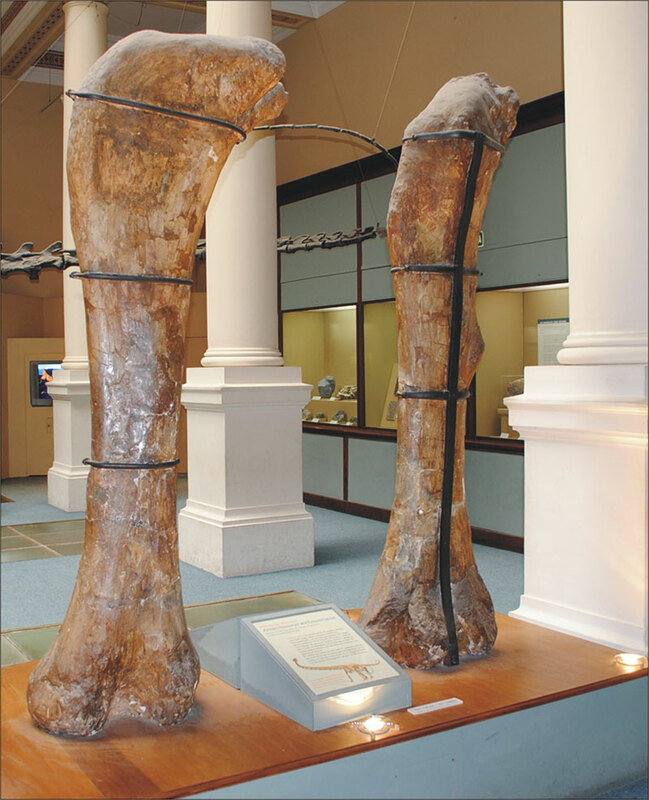 The two femora are given slightly different lengths of 222 cm (87 in) and 231 cm (91 in), with some restoration in plaster. Later, Mazzetta et al. (2004) amended the length of the larger femur to 235 cm. Today the specimens are in the Museo de La Plata in La Plata, Argentina, as MLP 26-316, and the source rock is considered to be the Plottier Formation of the Neuquén Group (Otero and Reguero 2013). Incidentally, the Plottier Formation has more recently yielded fossils of another giant titanosaur, Notocolossus gonzalezparejasi (González Riga et al. 2016), but unfortunately there is practically no overlap in material (as noted in the supplementary material). "A." giganteus has spent the years since 1929 being noted every so often for its size. In one of the more detailed discussions, Van Valen (1969) drew attention to this species as one of the largest dinosaurs then known. He also made the curious decisions to consider it a growth stage of A. wichmannianus (for one thing, they are not in fact from the same formation, contra the article) and to sink wichmannianus into giganteus, when it is reasonably clear that von Huene considered wichmannianus to be the exemplar for Antarctosaurus (page priority and that "cf." business, after all). (It's not as if I'm the only one to notice these issues; Bonaparte and Gasparini 1979 got there before I was even born.) Carpenter (2006) classified "A." giganteus as a "super-sauropod" of 23 m (75 ft) length, via scaling up from Saltasaurus. This would come out quite a bit differently today, because Saltasaurus is a diminutive titanosaur with a relatively short neck, while we now have much more complete large titanosaurs than we did in 2006, and they are not exactly shy in the neck department. Mazzetta et al. (2004) estimated that the type individual of "A". giganteus weighed around 69 metric tons (76 short tons). Whether or not "A." giganteus is a valid species and/or a species of Antarctosaurus depends on who you ask, but given the travails of A. wichmannianus it's probably safest to limit Antarctosaurus to just the type species. Bonaparte and Gasparini (1979) regarded it as a valid species, and Powell (2003) went one farther, suggesting it could represent a new genus. McIntosh (1990) treated it as a valid species of Antarctosaurus in the table of valid sauropods, but in the text was more cautious, noting that the femora were relatively much more slender than those of A. wichmannianus and the species might not belong to Antarctosaurus. By the second edition of The Dinosauria, it had been downgraded to a dubious species (Upchurch et al. 2004). I think there's a decent chance it is Notocolossus, but that will require more fossils. It's not even especially clear *where* the name was published, given some of the varying citation information floating around out there. What *appears* to be the publication (Riabinin 1938) can be viewed on Google Books, with a Russian version and an English version, and it certainly does appear that Riabinin (also transliterated as Ryabinin) threw the name out there in a faunal list and didn't actually get around to describing it, aside from mentioning a femur resembling that of "cf. Antarctosaurus" (=Jainosaurus) from India. No figures or catalog numbers were provided. This is not a helpful way to go about things. We do get the information that the femur came from the vicinity of Sary-Agach (=Saryagash), which is certainly within Kazakhstan and not Tajikistan as the Paleobiology Database currently shows. (I do have some concern that "A." jaxarticus was actually described in Riabinin , which I have not been able to find). To confuse matters just a little more, for many years its formation was given as the Dabrazinskaya Svita (or various spellings thereof; McIntosh 1990; Weishampel 1990; Maryańska 2000; Weishampel et al. 2004), but with changes in nomenclature and usage, it's now the Syuksyuk Formation (as per Averianov and Sues ; their Kyrkkuduk I locality), A.K.A. the Syuk Syuk Formation. Averianov and Sues (2017) considered the femur as from a indeterminate lithostrotian titanosaur, but I suspect this identification comes from the original comparison to Jainosaurus, because there's no indication that they saw the femur. For that matter, I haven't come across any evidence at all that the femur still exists, or where it might be. "A." jaxarticus is primarily of interest as the first published evidence of the existence of titanosaurs in Upper Cretaceous rocks of central Asia, and to date is the only attempt to name one. The preceding may well be the most that anyone has ever written about "A." jaxarticus, and could keep that position unless the femur turns up. *Procheneosaurus, the genus considered valid on the basis of two sentences, no type species, a type specimen by implication, and no indication that the author intended to create a new name. I will never tire of picking on Procheneosaurus and the decision to consider it legitimate. Averianov, A., and H.-D. Sues. 2017. Review of Cretaceous sauropod dinosaurs from central Asia. Cretaceous Research 69:184–197. Candeiro, C. R. A., A. G. Martinelli, L. S. Avilla, and T. H. Rich. 2006. Tetrapods from the Upper Cretaceous (Turonian–Maastrichtian) Bauru Group of Brazil: a reappraisal. Cretaceous Research 27:923–946. Carpenter, K. 2006. Biggest of the big: a critical re-evaluation of the mega-sauropod Amphicoelias fragillimus Cope, 1878. New Mexico Museum of Natural History and Science Bulletin 36:131–137. González Riga, B. J., M. C. Lamanna, L. D. Ortiz David, J. O. Calvo, and J. P. Coria. 2016. A gigantic new dinosaur from Argentina and the evolution of the sauropod hind foot. Scientific Reports 6:19165. Huene, F. von. 1929. Los Saurisquios y Ornitisquios del Cretáceo Argentino. Anales del Museo de La Plata 3:1–196. Kellner, A. W. A. and S. A. K. de Azevedo. 1999. A new sauropod dinosaur (Titanosauria) from the Late Cretaceous of Brazil. National Science Museum Monographs 15:111–142. Kellner, A W. A., D. d. A. Campos, and M. N. F. Trotta. 2005. Description of a titanosaurid caudal series from the Bauru Group, Late Cretaceous of Brazil. Arquivos do Museu Nacional, Rio de Janeiro 63(3):529–564. Maryańska, T. 2000. Sauropods from Mongolia and the former Soviet Union. Pages 456–461 in M. J. Benton, M. A. Shishkin, D. M. Unwin, and E. N. Kurochkin, editors. The age of dinosaurs in Russia and Mongolia. Cambridge University Press, Cambridge, United Kingdom. Mazzetta, G. V., P. Christiansen, and R. A. Fariña. 2004. Giants and bizarres: body size of some southern South American Cretaceous dinosaurs. Historical Biology 16(2–4):71–83. McIntosh, J. S. 1990. Sauropoda. Pages 345–401 in D. B. Weishampel, P. Dodson, and H. Osmólska, editors. The Dinosauria. University of California Press, Berkeley, California. Otero, A., and M. Reguero. 2013. Dinosaurs (Reptilia, Archosauria) at Museo de La Plata, Argentina: annotated catalogue of the type material and Antarctic specimens. Palaeontologia Electronica 16(1):3T. Powell, J. E. 2003. Revision of South American titanosaurid dinosaurs: palaeobiological, palaeobiogeographical, and phylogenetic aspects. Records of the Queen Victoria Museum 111. Riabinin [or Ryabinin], A. N. 1938 [not 1939]. [Some results of the studies of the Upper Cretaceous dinosaurian fauna from the vicinity of the Station Sary-Agach, south Kazakhstan.] Problemy Paleontologii [Problems of Paleontology] 4:125–130 [in Russian], 130–135 [in English] [not 175–184]. Riabinin [or Ryabinin], A. N. 1939. [The Upper Cretaceous vertebrate fauna of south Kazakhstan. I. Pt. 1. Ornithischia]. Centralnyj Naučno−issledovatelnyj geologičeskij Institut, Trudy 118:1–40 [in Russian]. Upchurch, P., P. M. Barrett, and P. Dodson. 2004. Sauropoda. Pages 259–322 in D. Weishampel, P. Dodson, and H. Osmólska, editors. The Dinosauria (2nd ed.). University of California Press, Berkeley, California. Van Valen, L. 1969. What was the largest dinosaur? Copeia 1969(3):624–626. Weishampel, D. B. 1990. Dinosaur distribution. Pages 63–139 in D. B. Weishampel, P. Dodson, and H. Osmólska, editors. The Dinosauria. University of California Press, Berkeley, California. Weishampel, D. B., P. M. Barrett, R. A. Coria, J. Le Loueff, Xu X., Zhao X., A. Sahni, E. M. P. Gomani, and C. N. Noto. 2004. Dinosaur distribution. Pages 517–606 in D. Weishampel, P. Dodson, and H. Osmólska, editors. The Dinosauria (2nd ed.). University of California Press, Berkeley, California. Wilson, J. 2005. Redescription of the Mongolian sauropod Nemegtosaurus mongoliensis Nowinski (Dinosauria: Saurischia) and comments on Late Cretaceous sauropod diversity. Journal of Systematic Palaeontology 3:283–318. Is there anything named by Riabinin that has actually really ever amounted to anything? Well, Batrachognathus has its charms. A. giganteus could still be synonymous with Notocolossus gonzalezparejasi, though, provided new overlapping material is found. IMO Notocolossus giganteus is a slightly catchier name. I wonder if "A." brasiliensis could be rescued from obscurity with some restudy. Partial dorsal vertebra and two partial limb bones wouldn't be the worst valid titanosaur holotype. I'm sure both Antarctosaurus species were mentioned in passing a number of time before Van Valen; a much more extensive survey than mine would be necessary to determine who might qualify as "first revisor", but I think von Huene's original designation of A. giganteus as "cf. Antarctosaurus giganteus" makes it clear what he thought. N. giganteus does roll off the tongue more easily, although it's slightly redundant ("southern giant colossus", more or less). As for "A." brasiliensis: chalk up another one for the "potential grad student project" bin! That certainly does appear to be the case. I'll make a note. New information noted. Thank you!